Robert Shaw 'Joy to the World' Mono LP Cover Art? Title: Robert Shaw 'Joy to the World' Mono LP Cover Art? 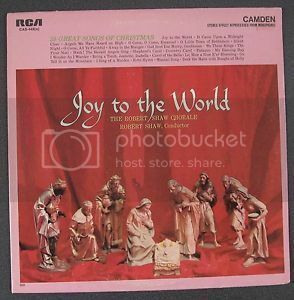 Does anyone here have the LP sleeve of the of the RCA Camden mono release of Robert Shaw's "Joy to the World"? I'm being forced by declining health and the insane rents out here in Seattle to downsize, so I'm going to have to take the better part of my LP collection to the used record store. The Robert Shaw "Joy to the World" is a sentimental favorite of mine, because it was, if I recall correctly, the first Christmas LP I ever bought. That LP was the mono version. Somewhere along the way I lost it, and replaced it with the "re-processed stereo stereo effect" version, and then, over a decade ago, I stumbled upon a CD version of it, which I still have. But that CD doesn't have the original cover art. My memory may be playing tricks on me, but I seem to recall that the color image on the mono jacked filled up the entire jacket, edge-to-edge, without the pink borders around the edge. Does anyone of you have a jacket that looks like that? P.S. When I first tried to post this earlier today, I was unable to get the "Insert image from PhotoBucket" button to work. But now it's working fine! I wonder if I can delete my second message. Re：Robert Shaw 'Joy to the World' Mono LP Cover Art? That's correct; the original album jacket artwork did not have the pink borders around the edge. It is posted below. My pleasure, Will. By the way, if you'd like me to send you the image as an mp3 attachment in an email, just let me know. Sorry to hear you have to downsize your collection because of your housing dilemma -- especially that it should come this time of the year. Moving is never easy, and I hope it works out well for you, and that it does before Christmas. Thanks for the commiseration. Thank god I won't have to move again this year. My last move nearly killed me, I swear. I've got temporary, if not very satisfactory but affordable quarters, where I can "shelter in place" until I can get my lifetime collection of junk pared down to the point where I can manage the next move. Thanks for the offer of " the image as an mp3." That would be a neat trick if you could pull it off: an image you could listen to. But, seriously, yes, I'd appreciate a JPG or PNG copy of that cover art, if it's not too much trouble. Even though the recording quality of the "Joy to the World" album is nowhere as nice as the "Christmas Hymns and Carols" album, I'm still partial to the "Joy to the World" recording because that was the one I listened to as a teenager back in the 50s, and it evokes a lot of memories for me. And thanks for all work you're doing to keep bringing back into print so many of our favorite "lost" Chirstmas music treasures. You really are something of a "national treasure" yourself. A senior moment, Will; I meant to say jpeg. And thanks for that very sweet thing you said about me. Oh, my! Another Christmas chestnut that got lost in a family move! I recall receiving "Joy To The World" for Christmas 1961.